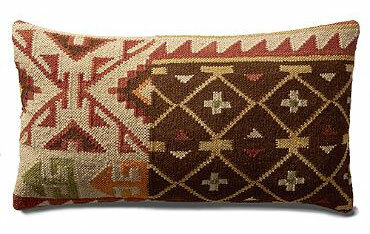 Kilim pillow covers are one of the best ways to decorate your interiors and turn the boring to brilliant. They have developed a considerable fan following and there is no reason for you to be deprived of it. Kilims are actually flat tapestry woven rugs that are very much lighter than regular rugs and this makes them a great choice for pillow, cushion and sofa covers, wall hangings in addition to being used as a carpet. 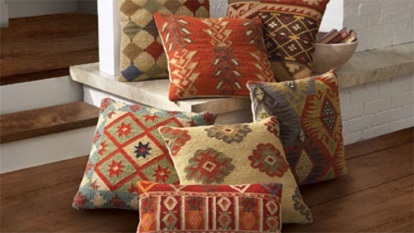 Kilim pillow covers at Rug Store can be found in mind blowing array of colors, designs, weave and utility. They are both antique and modern. Manufacturing kilims started in medieval Turkey. The manufacturing techniques, patterns, designs, weave vary from region to region. This excellent craftsmanship has been carried forward without any compromise on quality and today kilims are both hand woven and machine made. Wool is the most common material since its inception though cotton and silk are also used and their number is on the rise. They are a solid statement of style and quality. They give your home colorful, zesty touch and induce a global flavor so that it stands out from regular homes. 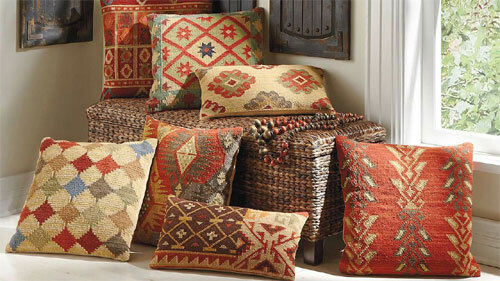 Kilim pillow covers in your outdoors, living room, bedroom is sure to make heads turn and sure to be followed by others. At Rug Store, we have an unmatched collection of kilim pillow covers assorted according to size, shape, designs, patterns, type of weave and utility. Our collection is exemplary and you will find nothing but the best under our roof. Turkish, Persian, Afghan and a plethora of other types of covers are available with us. Our commitment to you is defined by our dedicated and friendly customer service and our constant striving for excellence. Visit us at Rug Store and make your home a testimony of comfort and fashion. Copyright © kilimcushion.com. All Rights Reserved.